Practical information on using combustion to combat oil spills is contained in a report released recently by the Department of En- ergy's Pacific Northwest Laboratory (oper- ated by Battelle Memorial Institute). The purpose of the report is to provide decision-makers with information they can use when considering combustion as an op- tion in combating oil spills. Use of combus- tion is evaluated for disposing of oil within a stricken vessel, oil on water and oil-con- taminated debris. C. Hugh Thompson, project manager. Signif- icant points to consider in deciding whether to use combustion and research and tech- nology development needs complete part one. Division of Steelstran Industries, Incorporated also includes a discussion of the ethics of oil burning and a comparison of combustion with other alternatives for dealing with oil spills. United States Department of Commerce, 5285 Port Royal Road, Springfield, Va. 22151. Norwegian sector of the North Sea. Included in the project are the hookup and commis- sioning of the facilities. These topside facilities are made up of a three-level deck weighing 7,100 tons, four separate modules with a total weight of 6,700 tons, a 120-ton bridge, and a 300-ton flare boom. Fabrication will begin in Norway and is scheduled to be completed in January 1981, with final hookup scheduled for July 1981. La. Oceanic will transport the jacket and install it at a site in the Valhall field where water depth is 230 feet. Amoco's quarters platform. It will also in- stall this platform and hookup and commis- sion facilities on it. This contract formerly belonged to the Netherlands Offshore Com- pany. McDermott Norge also has notices of in- tent from Amoco to transport and install a drilling platform in the Valhall field and to lay and bury two 20-inch pipelines (one to transport oil, one for gas) from the field 22 miles north to facilities in the Ekofisk field. Company was recently announced by G.W. 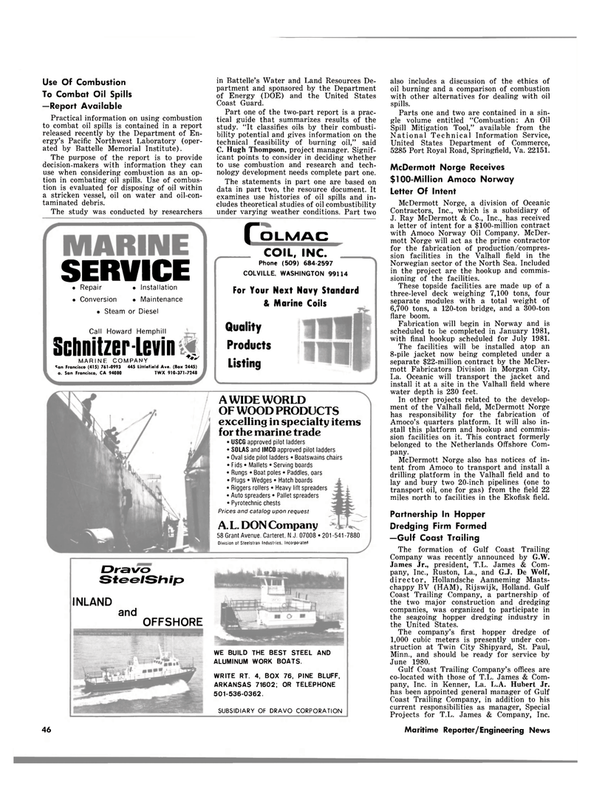 Coast Trailing Company, a partnership of the two major construction and dredging companies, was organized to participate in the seagoing hopper dredging industry in the United States. Projects for T.L. James & Company, Inc.
ARKANSAS 71602; OR TELEPHONE 501-536-0362.